Cool art ahead! There are artists who grow detailed grass portraits. And, yes, it is as cool as it sounds. We can’t get enough of these super-cool portraits and we know you’ll understand once you see them. Have you ever wondered what a grass picture would look like? Ya, neither did we. But now we are SO excited to know that they exist. There are two British artists who use grass as their photography medium, and their results are magical. Dan Harvey and Heather Ackroyd combined the idea of a photographic negative and grass materials to create grass portraits. And it’s pure brilliance. In a story from the Weather Channel and Great Big Story, you can see the entire fascinating process from start to finish. "I think we create these pieces partly because we just love the magic in seeing them imprint and come to life and grow," Harvey explains in the video. The duo mastered combining science, nature and art into one item and all it takes are seeds, water paste, and a photograph. If you’re still a little confused, we will explain. To start, the artists take grass seeds and place them onto a canvas using water paste. The grass then grows vertically in a studio used as a dark room. The only light comes from a projector putting the photo negative up. In the end, you have a fully-developed picture on grass, aka a grass portrait. Instead of your normal black-and-white images from a photo negative, you have light and dark greens to show the features of the picture. And it’s stunning. They are pretty much life-sized Chia pets, and you need to see it happen by watching the whole video above. 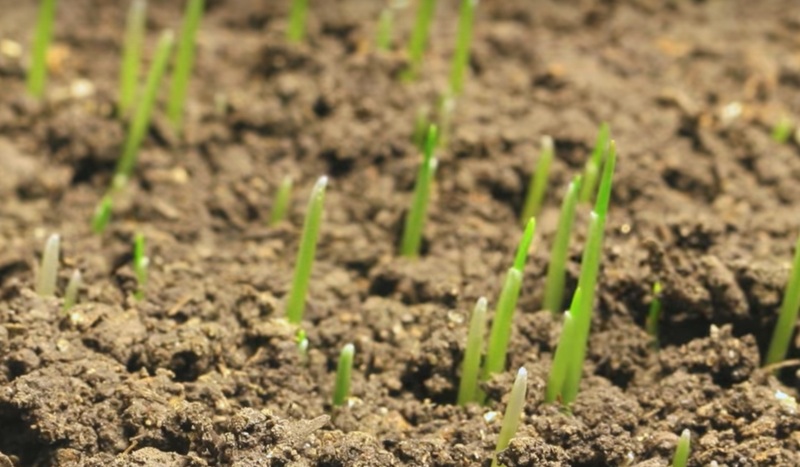 It’s way more interesting than watching grass grow, we swear!